Apple Maps has emerged onto the technology scene, presenting a direct competitive challenge to Google Maps. Some claim it was introduced before it was ready, pointing out numerous flaws. Meanwhile, Google isn’t going away, and will continue to develop and improve upon their already widely popular application. Even so, with Apple upgrades to iOS6 looming, Apple is serving its Maps as a free app, meaning millions will use it with their iPhones, iPads, and MacBooks. 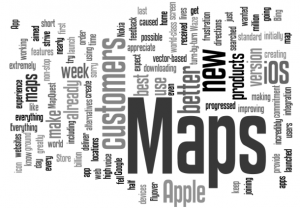 Your search engine optimization plan, in Utah or anywhere else, needs to ensure that Apple Maps works for your business. While plenty of Utah-based SEO companies will use sophisticated means to accomplish this, taking some basic steps goes a long way. 1. Are You Listed Correctly? Start by running a search on an iPhone or iPad for your company. If you are listed, you should be able to find yourself using your business phone number, business name and address, and business name and city. If you do not show up in the results, this likely means you (a) are not in the Apple Maps database, (b) do not have your location in the Apple Maps Database, or (c) have a location that autofills incorrectly, such as Springfield in a different state. At this point, there is no way to add your business directly to Apple Maps. It receives its data from Acxiom, LocalEze, InfoUSA and TomTom, and relies on Yelp for reviews, so check to verify the accuracy of your listings with those providers. In addition, you can use “Report a Problem” to request that Apple troubleshoots an issue. If you are listed but have inaccurate information, the route will be similar. Apple Maps is merging data from multiple locations, and conflicting data can produce unpredictable results. By checking each source and verifying information, you’ll help ensure that you’re ready to go on Apple Maps. Apple obtains its business reviews from Yelp, displaying the most recent entries first. Potential customers will use this information when deciding whether to give your business a try. This doesn’t mean that you should buy positive reviews, of course, but encouraging satisfied customers to leave feedback can be highly effective. You might consider including a link for customers to post reviews directly from your home page. In addition to reviews, Apple Maps pulls photos of your business from Yelp. Take the time to review any photos in your Yelp profile and make sure they reflect well on your business. Because Apple Maps is still very new, plenty of bugs are still being worked out. It isn’t enough to correct your profiles with the aggregating sites, or even to see your information displayed correctly and positively on Apple Maps itself. As the app develops, the ground will continue to shift. The world of online business profiles changes constantly. Monitor your Yelp profile and business information on a regular basis. Claim your profiles on the sites that allow it, and continually update data as it changes. The more you work to boost your business reputation and generate word-of-mouth referrals, the better your reviews will be on Yelp. In the midst of your SEO marketing and data monitoring, don’t lose sight of the business itself.